Q: When can I start using sunscreen on my baby? A: In the past, doctors have recommended not using sunscreen on babies under 6 months of age, instead suggesting keeping them protected from the sun by using light layers of clothing and sunhats. The reason is that baby's skin is much more sensitive to the different chemicals that your sunscreen may contain and is more likely to absorb it. Guidelines have lightened up lately however and doctors now say that while it's still best to keep younger babies out of the sun, you can now use sunscreen on babies under 6 months if you are unable to keep them out of the sun. But, be sure you use a sunscreen with all natural ingredients and no harsh chemicals, and do a small spot test on your baby's skin first to make sure there is no averse reaction. Q: What is the difference between Physical Barrier and Chemical sunscreens? A: Physical Barrier sunscreens use opaque minerals to form a layer on top of the skin that reflects UV light. Their active ingredient is either Zinc Oxide or Titanium Dioxide. Chemical sunscreens work by absorbing UV rays (instead of reflecting them). Usually, a chemical sunscreen can either protect against UVA or UVB, but not both. In order to get broad-spectrum protection, you could have to choose a sunscreen with multiple chemicals, and since this type of sunscreen is absorbed into the skin, it is more likely to cause irritations or allergies. 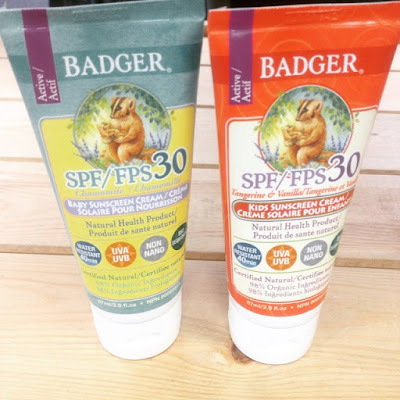 Q: What does the SPF rating really mean? A: SPF (Sun Protection Factor) is a measurement of how well your sunscreen will protect your skin from UVB rays (the kind that causes sunburn and is thought to contribute to some types of skin cancer). For instance, if your skin would normally burn after 10 minutes of sun exposure, applying an SPF15 sunscreen would allow you to stay in the sun without burning for 15 times longer, or 150 minutes. This is a rough estimate and can vary depending on your skin type, intensity of sunlight and your activity. But because the SPF rating only tells you the protection against UVB rays, you are still absorbing UVA rays. UVA rays don't cause surface burning, but can potentially release free radicals which can cause skin melanoma. Your sunscreen should have a minimum SPF15, but don't simply choose a sunscreen with a high SPF rating, also make sure it is broad-spectrum, meaning it protects against both UVA and UVB rays. Q: What should I look for in my child's sunscreen? A: Try to stay away from Chemical sunscreens for your child's sensitive skin, and instead look for a Physical Barrier sunscreen. If you can, find one that states "non-nano" zinc oxide, as there has been concerns with nanoparticles that could be absorbed into the body. Also look for a water resistant option as you will need to re-apply less often. Organic and natural ingredients will be much more gentle on your child's skin and nature too! Staying in the shade and avoiding the sunlight during midday are of course the safest sun protection, but we are parents, and we know that kids will play in the sun this summer, so look for clothing that has built in UV-protection (rashguards and sunhats often do), use sunscreen with UVA and UVB protection and keep the above advice in mind when shopping for your child's sunscreen. At Kids Trading Company we sell Badger all natural, organic sunscreens for baby and kids. They are a water resistant, non-nano, broad spectrum sunscreen with SPF30. It's bio degradable and Badger never tests on animals.